﻿ Howie Hayman - My fishing page. Welcome to my new fishing section. I thought this should be included on my site since fishing was, and continues to be, an important part of my family. I began fishing with my parents back in Kenmore, New York. Much of the fishing took place at foot of Ontario Street in Tonawanda, New York and in Fort Erie, Ontario, Canada. My dad used to bring home black bass from the Crystal Beach pier in Fort Erie while my mom enjoyed fishing at the foot of Ontario street catching perch. Years later we all moved to San Diego, California and continued our fishing tradition at the famous Ocean Beach pier. Now I am in Tanegashima, Japan with my wife Akiko and son Shai. We go fishing all the time and are catching a wide variety of fish. Yup fishing in the tropics is way different than fishing in Western, New York and even Southern California. The fish around this island are both colorful and very tasty, definitely due to the pristine ocean conditions where they reside. If you like fishing, and especially if you plan to visit Tanegashima, please visit the following couple of pages for detailed information about the places to catch fish, the types of fish, and the amount we are catching. 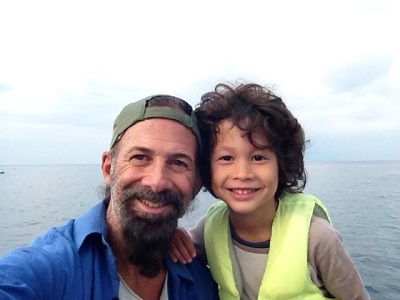 Picture - Me and Shai fishing at the pier a few minutes walk from the house.